Our LYS recently started carrying Tilli Thomas yarn. As luck would have it, their stock came in just as I was desperately seeking something special for my mother's birthday. She loves the knitted and woven things we make for her, so special yarn seemed to fit the bill perfectly! I decided on a skein of Rock Star in Jade for Mom. I showed her the yarn this past weekend, and she loved it! I've since cast on for a scarf, and it is working up pretty well. The skein only had 100 yards (at $40 a pop!) so I am rather limited here. The yarn is so incredibly soft. The slight variations in the shading are beautiful, too, and the glass beads add a special pop. I don't think you can get the full effect of just how pretty this yarn is based on the photo. It is overcast here today. I hope that means we'll have some rain. The world is yellowish green and dusty at present--completely pollenated. You can see tracks in our drive where we pull the cars in through the pollen. I'm tired of it. My head and sinuses are tired of it. Ah....there is nothing like spring time in the south! I don't have much to say and nothing to show you. However, to quell the rumors that I've dropped off the face of the earth, here's a post. We've been in full scale drama mode here lately, and I'm talking about the play! Last week was "hell week" meaning the kids had practice every day until all hours of the night. That meant the parents had pick up responsibilities until all hours of the night. The show opened on Thursday evening and continued through Saturday--two shows on Saturday. It was amazing. The singing was great, the dancing was great. I was so impressed with those kids. They put heart and soul into it, and their hard work paid off. I've not touched knitting to speak of in ages. Ditto spinning. There has been so much going on around here that I just haven't been able to settle down and relax with anything. I hope that changes soon. Nope, I'm not talking about ribs. I'm talking about my baby girl--my 14 year old grown up lady baby girl. She's been gone all week (class trip to DC) and I miss her!! She should be home in approximately 3 hours! Yay! Husband and I have enjoyed ourselves this week--doing bad things like eating in front of the TV, going off on an adventure at the spur of the moment. I guess we're back to being responsible adults again in a few hours. I had business in Savannah on Thursday, so the two of us took off Wednesday afternoon to drive down. We met one of my co-workers for dinner that night and had a lovely time. We ate at a restauarant on River Street called The Cotton Exchange. The food and service were fantastic, the view was great, and the prices were reasonable. I particularly recommend the Savannah Crab Dip appetizer! I've been "off" my knitting the last few days. I took it along on the trip to Savannah, but it never came out of my bag. I have several projects in progress that need to be finished. Maybe I'll get at them over the weekend. For today's post, I'm sending you on a field trip! Please visit husband's blog to find out what's going on around here. Our little birdy flew away yesterday (courtesy of a charter bus, not an airplane). Her class from school is touring DC and having a blast from all reports. I miss her greatly, but I'm also liking this little taste of couplehood that husband and I are enjoying. The school has been trying since fourth grade to prepare us parents for the day when our kids will eventually leave home. They start out small with an overnight trip to the zoo, then move up to 2 day trip a few hours away, and now this big week-long adventure many, many hours away. *sigh* It's hard to believe my baby is growin up so quickly. The first 14 years of her life have flown by, and I feel certain that will just continue. The garage/"fun room" renovation is about 99% complete. They still need to put some light fixtures in and install outlets for the cable television. We're shopping for a sofa to go in the room but no luck yet. Concrete was poured this morning for husband's outdoor tool sheed/wood work shop. It all went well until the truck was leaving and ran over a sprinkler system control box. Someone's going to have to fix that, and fortunately it isn't us! I just finished reading a good book about the Civil War: The Widow of the South. Carolyn recommended the book. It is a novel based on a true story. I find the Civil War era very interesting partly because I'm a native of the South and many of my ancestors fought in the war (on the Confederate side). Knitting has taken a bit of a back seat lately. That happens when I get immersed in a good book! I'm still plugging along on a lacey stole and lusting over this pattern. I'm just not sure how those sleeves would look on my fat upper arms! It seems that it would be easy enough to modify the pattern to do a different type sleeve. I received a package from my Knitty Secret Pal yesterday. Thanks, Pal! I love the Bryspun circular needles. They are some I've been wanting to try for a long time, but they are not available locally. Pal is trying to throw me off her trail it seems. This package came from a different state than the last one. Hmm. Renovations are coming along great. We are so ready for them to be done. The house is in a bit of a mess right now, and my clean freak tendencies are about to get to me. 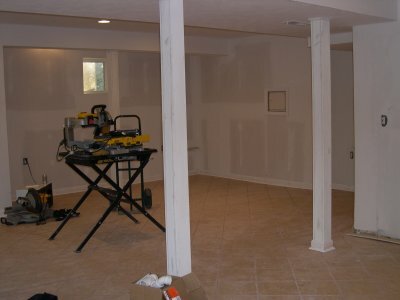 Here are some photos from the "Fun Room" renovation. Here are the French doors, or one set of them. There is another set on the other side of the room. 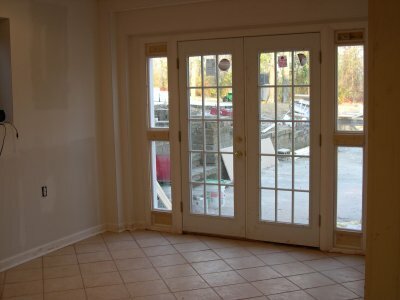 Remember, this was a two-car garage, but we've replaced the garage doors with French doors to let light in. This view shows the back view of the room as well as the nice columns that were built to cover up the ugly steel pipe supports. Here is our wet bar area. It is also at the back of the room. 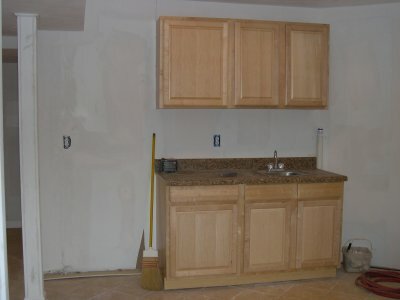 To the left of the cabinets (when you are looking at the picture), we'll put in a refrigerator. There will be shelves on the right of the cabinets. I love those cabinets. They are maple. Our contractor had them left over from another job, so we got them at a discount. They are much nicer than I thought we'd have in this room. I don't have any knitting to show. I have not felt much like knitting lately. I'm fighting off a stomach bug and adjusting to some new medication, and that has me rather worn down. I have been drooling over a couple of things in the new issue of Knitty, however. I like Isabella. There are also several nice sock patterns in this issue, but I've been "off" socks for a while. Is Knitting Pattern a Day 2006 the next big thing? I have this--paid $8.50 for it last year when it first came out. I wasn't all that impressed! Other "big ticket" knitting books are Jess Hutchison's toy book which recently went for close to $90 on e-bay and of course the ever-popular Principles of Knitting which is currently listing for $279 on Amazon. Unreal, I tell you. I'd forgotten that our friend Carolyn was going to be in town Thursday while her husband did some work in the area. It was a very pleasant surprise to get a call from her mid-day. I decided to sneak out for lunch with Carolyn, and we ended up back at the house to hang out, talk, stalk my yarn closet, and just have a grand time together. Husband phoned home and was jealous that we were having such a good time, so he ditched work a little early and came home to visit with Carolyn. Thursday evening we attended high school transition night at our daughter's school. It is hard to believe that our baby will be in high school next year. It seems like only yesterday we were starting her in Kindergarten. She's been at this school now for 9 years, and we fully expect her to finish her high school years here, too. We're starting to work with her on choosing classes for next year. Right now, she's planning to try the two honors courses that are available to her (geometry and biology), her core English and World History, Spanish Level 2, and an elective. I'm not sure if they take one or two electives in 9th grade, but her top choices (in order of preference) are Intro to Studio Art, Theatre Performance, Theatre Technical, and Chorus. It should be a challenging year in many ways. 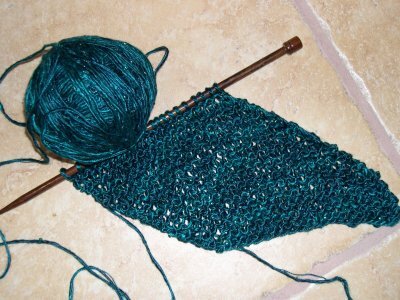 I'm plugging along on a Green Gable (in Royal Blue) for daughter. I finally got her to stand still long enough to try it on, and it seems like it is going to fit great. I've up-sized the pattern a bit to accommodate my larger boobage and have cast on in a medium blue Cotton Ease for myself. I'm not far along enough to try it on and see how my fit is. I'll try to get some photos this weekend, time permitting. The renovations are coming along well in the house. Almost all the tile is laid in the new den/rec room/sun room/whatever. It looks fantastic. On Monday, the washer and dryer come out so that the laundry room can be tiled. I'm not looking forward to being without a washer and dryer for a few days, but it should be OK.
We're less than a month away from the big theatrical production! Rehearsals are ramping up. They have one every weekend from here on out. I can't wait to see the show--Anything Goes.